West Dunbartonshire Council is to cut two-and-a-half hours from the primary school week in a bid to save about £1m. The cut would affect time for things like "golden time" and assemblies. The council said teaching time with the regular class teacher would remain protected. A consultation will suggest options such as an early daily finish or early finish on Fridays. 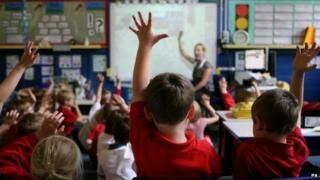 The plan, which will be phased in from August, has been branded "a disgrace" by some parents. Labour-run West Dunbartonshire Council is looking to make £17m of savings over the next three years. In agreeing its latest budget, the authority said it had to make "tough decisions to balance its budget" after seeing its funding "reduced by 22% over the past five years". In a statement, the council said: "One of these decisions is to change the primary school week from 25 hours to 22.5 hours per week. "This will match the 22.5 hours per week that teachers are currently contracted to spend in the classroom. A number of other councils are currently considering similar changes. "In the current timetable the 2.5 hours in question are currently provided by teachers who are not the pupils' usual class teacher, and may in some cases include periods of 'golden time' or assemblies." The council said that the new timetable would be shorter "but the teaching time with the class teacher remains protected and will deliver our pupils a high quality of education". The statement concluded: "The council will begin a consultation with parents in March to see how best to introduce this change. "That could include increasing capacity in breakfast clubs and starting the school day at 9.30am, or ending the school day at 2.30pm each day. "Alternatively it could be keeping the current hours of 9am to 3pm from Monday to Thursday and finishing the school day at lunch time on Fridays. Other patterns are also possible." The council said it would aim to introduce agreed new arrangements "on a phased basis from August 2015" starting with primary one to primary three children. One West Dunbartonshire parent, Clare Henderson, said of the council: "Their announcement yesterday to reduce the school day for primary school children in West Dunbartonshire by 2.5 hours (19 days over a school year) is a disgrace. "The true sentiment of parental feeling is apparent in the social media group on Facebook." Ms Henderson said the page titled "No to reducing primary school hours in West Dunbartonshire" had been set up to provide "a central place for parents to register their feelings". She added: "The page has attracted over 2,000 likes and the online petition set up by another parent has over 2,500 signatures."